EcoSphere Closed Aquatic Ecosystem | Nerd Much? Introducing the EcoSphere Closed Aquatic Ecosystem, a fascinating entirely enclosed world that contains marine shrimp, algae and micro-organisms that all live off of each other. Each EcoSphere only requires indirect light and a comfortable room temperature (between 60F and 80F) for the organisms to survive. Basically, this little ball off life recycles its own nutrients and doesn’t produce any excess waste, so you never have to clean it or worry about feeding it. Simply buy it, put it somewhere with some sunlight, and watch your shrimp live on for years. The glass is a hand blown sphere with a 4″ diameter, containing 3 to 4 shrimp and filtered sea water containing algae and microorganisms. The EcoSphere can be attributed to two NASA scientists, Dr. Joe Hansen and Clair Folsome at NASA’s Jet Propulsion Laboratory in California while NASA was researching self-contained communities for space explorers. The EcoSphere contains the same essential elements found on Earth — air, water, life. The shrimp live by consuming the algae and breathing oxygen in the water. If you keep a close eye on them, you’ll find the shrimp feeding on the algae and picking bacteria off the sea fan and lightweight gravel that is in the EcoSphere. Neat. 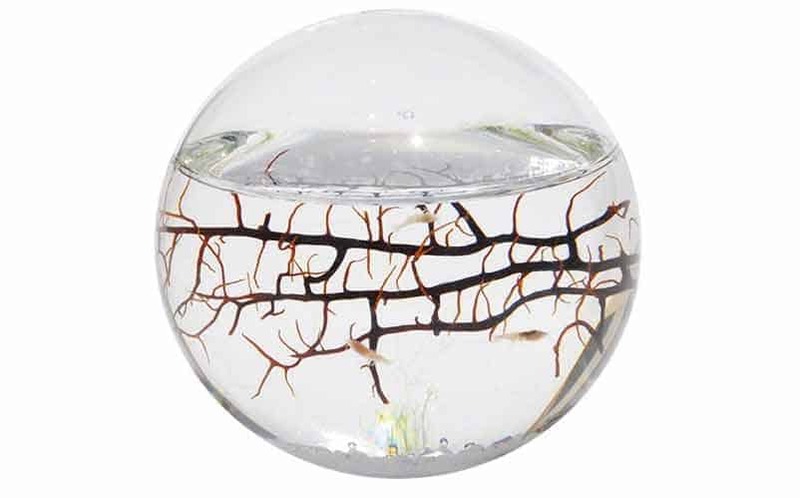 The EcoSphere also comes in three other sizes, medium (5.25″), Large (7.5″), and XL (9″). For more cool stuff, check out our hub, which will be continued to be populated with, well, cool stuff.